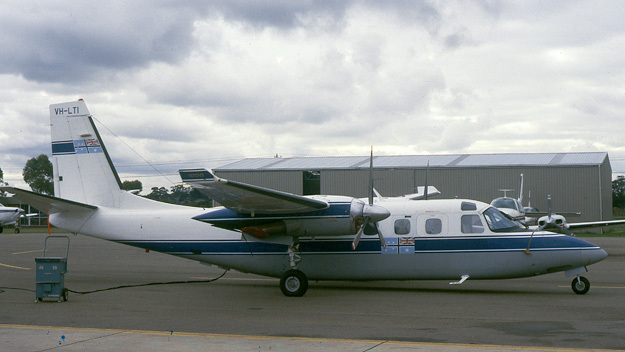 In 1983 the Department of Aviation obtained five new turboprop Gulfsteam American G1000s (effectively Aero Commander 695As) to replace the Department's fleet of earlier Merlin IIs and IIIs. Powered by two Garrett Airesearch TPE 331-10 engines, VH-LTI (c/n 96063) was one of this batch and was registered new to the Department of Aviation on 27 May 1983. It is seen in this photo during Department of Aviation days with a white upper fuselage and wings, medium grey lower fuselage and nacelles, and dark blue trim. The Civil Air Ensign is carried on the fin. All the G1000s remained in substantially the same colour scheme, apart from a change of logo, throughout their service. The G1000s were fitted specially with hardpoints on the rear fuselage for dropping Search And Rescue (SAR) stores such as life rafts. Click here to see G1000 VH-LTJ fitted with SAR stores. Comprehensive navigation equipment was fitted including Omega area navigation equipment and a VHF Direction-Finder for homing on Emergency Locator Trasmitters (ELTs). The photo above shows a nearly-new VH-LTI at Adelaide/Parafield on 11 August 1983. In the background to the right is the temporary Control Tower erected at Parafield while the cab of the main Tower, at left, was replaced in 1980-81. Later in 1983 the temporary Tower was moved to Karratha in Western Australia. Below is VH-LTI nine years later at Melbourne/Moorabbin on 5 June 1992. By this time the Department had become the Civil Aviation Authority. Apart from removing the DoA titles on the fuselage, the colour scheme remains the same. 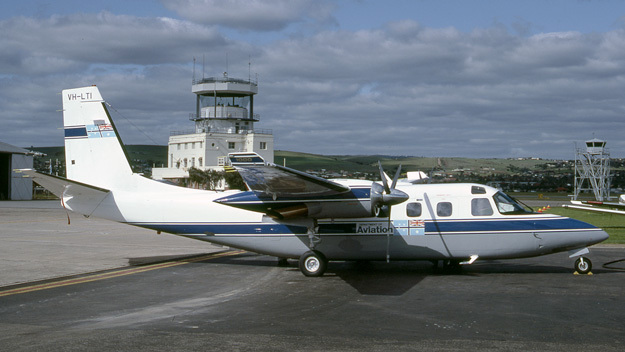 A sixth G1000 was obtained in 1986, however the aircraft were all disposed of c.1993 following the Civil Aviation Authority's 'Review of Resources'.